gains key focus when paused. 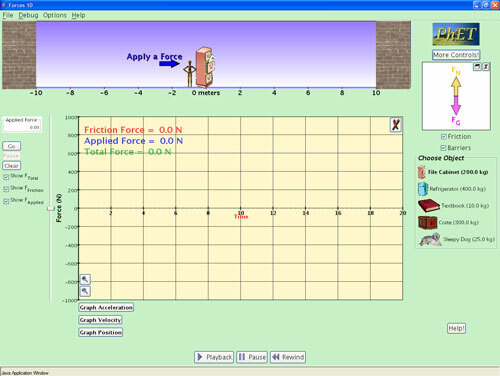 Fixed: Minimizing the Force graph, then deselecting checkboxes for each force doesn’t work. Fixed bug: Slider doesn’t auto-resize. Fixed Bug: Buttons don’t automatically change to reflect state changes. Fixed Bug: The ‘press go’ button after dragging the slider isn’t appearing. Set simple controls to be default. Set platform default look and feel. Cursor now disappears when reset. This should be fixed with buffering. I need smoother .png files for the man graphic. doesn’t run on a Mac. Tested on a mac, the ApparatusPanel doesn’t appear until resizing. Hey, wasn’t the slider supposed to jump back to zero when you let go? Resize FBD in separate window..?